Bio Hazardous Waste and Sharps Waste are all considered Regulated Waste according to OSHA's bloodborne pathogen standard 1910.1030. However, states have the ability to specify in more detail what waste falls into these categories and how this waste should be managed by the medical facility (or generator of waste). The reason for this is the states want to more clearly define without interpretation what waste should be classified as regulated to better control the management of this waste and to avoid any confusion as to what items may or may not be regulated. OSHA's guidelines and standards are to be referenced as a base foundation or minimum requirement for how waste is to be defined and what to do with the waste. From this foundation, each state can provide additional requirements that are more stringent and add limitations on storing this waste and more. For example according to OSHA's Bloodborne Pathogen Standard, contaminated sharps are defined as any object that can penetrate the skin including, but not limited to, needles, scalpels, broken glass, broken capillary tubes, and exposed ends of dental wire. The state of Texas however and takes this one step further and more clearly defines sharps as hypodermic needles, hypodermic syringes with attached needles, scalpel blades, razor blades, disposable razors, disposable scissors used in surgery, intravenous stylets, glass pasteur pipettes, specimen tubes, blood culture bottles, microscope slides, broken glass from laboratories, tattoo needles, acupuncture needles and electrolysis needles. Medical Waste is primarily regulated by state environmental and health departments. OSHA & EPA has not had authority, specifically for medical waste, since the Medical Waste Tracking Act (MWTA) of 1988 expired in 1991. After the incident in the 1980s where medical waste was found on multiple beaches on the east coast, Congress enacted the Medical Waste Tracking Act of 1988. This was a two-year federal program where the EPA was forced to create regulations on the proper management of medical waste which they did in 1989. These regulations went into effect June 24, 1989 in four states - New Jersy, Connecticut, Puerto Rico, New York and Rhode Island. These regulations expired on June 21, 1991. EPA concluded from the information gathered during this period that the disease-causing potential of medical waste is greatest at the facilities that are generating the waste and not just at the disposal site. This identified healthcare workers as having the highest risk of contracting diseases by exposure to medical waste. After the MWTA expired in 1991, the states largely took on the role of regulating medical waste under the guidance program. PureWay has already collected the regulation requirements for every state and condensed these requirements to a single resource page. One you have located your state regulations on PureWays State & Federal resources page, there are three very important items you need to pay close attention to. Each state may define sharps or bio hazardous waste differently. Review the definition of sharps and bio hazardous waste for your state to see how clearly the state defines each category. Why is this important? Medical waste disposal can be very expensive. If an office does not clearly understand what waste they are required to dispose of as medical waste, they might find themselves OVER-CLASSIFYING their waste. Meaning a healthcare facility will find them selves paying medical waste disposal rates for waste that could be discarded in the regular trash. For example, in medical facilities a very common item that is often found in a red bag is urine cups. Urine cups are not regulated medical waste unless there is a presence of blood which 99.999% of the time there is none. Another scenario is dental offices placing carpules inside of sharps containers. OSHA stated in 2007 that pharmaceutical containers, including anesthetics carpules used in dentistry, are generally not considered to be contaminated sharps unless they are broken and can penetrate the skin. Intact anesthetic carpules are not required by OSHA to be discarded in a sharps container. To conclude, it is extremely important a facility review the definitions for their waste by their state when evaluating their program. States can limit the amount of time waste can be stored onsite. This is different for generators, transporters and treatment facilities. In this blog I am referring only to waste generators. The state of California has a state run OSHA program (CALOSHA) which has defined specific storage limitations for sharps and for biohazardous waste. 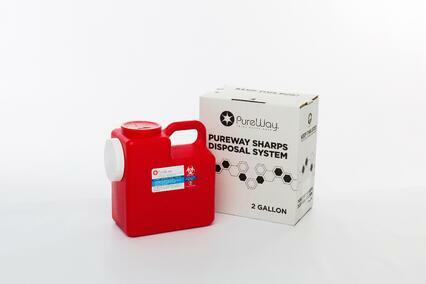 Sharps Waste: a small quantity generator of waste can store their sharps container indefinitely until the container is full, sealed and taken out of use. Bio-hazardous waste: a small quantity generator of waste can only store bio hazardous waste for 30 days from the date of generation in a container before it is removed from the facility and disposed of. Pay attention to the details and a office can dramatically reduce cost associated with disposal.